Choo Choo Tank Wash (food grade) is a 23 hour / 7 day full service tank and truck cleaning facility with over 30 years in business. We pride ourselves in providing superior quality and customer service. Our three state of the art wash bays offer exterior and certified interior washes included Cargill, Kosher, Hershey, ADM, JPA, detergent, caustic, hot/cold, dry bulk and conversion washes along with steam heating and drying. Our facility also offers filtered diesel, certified scales, showers, deli and driver's lounge. 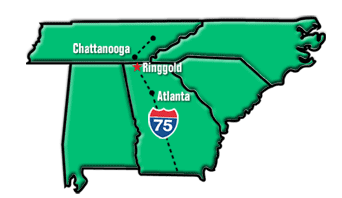 We are located along I-75 at exit 345 in North Georgia just 5 minutes south of the Tennessee state line. Drop-offs are welcome. Thanks for visiting our website. We appreciate your business and would like to show our gratitude by offering our VIP Wash Card program. Drivers receive discounts on wash packages and in-store purchases. Click on the VIP link under Products/Services for more details.